Despite it being relatively tough you should not be careless when using cutlery, knife marks are a common repair. Regardless of what some retailers state this item does stain, we tackle a great deal of damage from bleach or stained surfaces. Surfaces suffer from friction wear, often losing the sheen and going dull over time from general wear and tear, the surface can become distressed in appearance. Surface damage repair from scratches due to daily use and sliding objects over the area. Miss drilled holes from careless tradesmen. Easy to work with, (easily cut, planed, sanded and sculpted). Can be formed to any shape. Favored over some other choice materials because it is very attractive and the design and it is possible to manipulated colours to suit users needs . 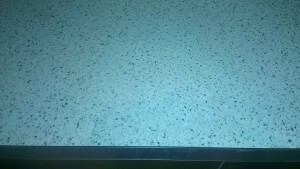 Corian worktops are able to mimic many effects, commonly, the main colour available was in white. But advancements in the product's design and popularity have helped it to grow and improve over time and has vastly changed its appearance . 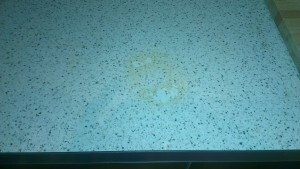 Corian is stain resistant, some people who have purchased these items are miss sold the product or have poor knowledge on the material and fail to clean up spills. It is a great product that is non-porous and stain resistant but staining materials such as foods high in colorings must be cleaned asap to avoid stains. Completely unique images imbedded into the worktop during processing if required to create glittery or diamond effects. Unique colours to stone mimic surfaces. Despite some cons this is an ideal product for use in the home for a variety of reasons, it is a non porous which offers a great deal of positives for the end-user, but this can create problems when attempting to make a large chip or gauged surface repair. Being a non porous there is less chance of the material being stained. Corian is reasonable priced when compared to stone or granite and offers similar advantages. If you decide to have it installed as a new worktop it could save a little money on the over all price at the end of the installation. Some clients I have spoken may have been ill-advised or lead to the conclusion that Corian is resistant to all forms of heat, which is not true. Taking steps to avoid heat damage heat damage is advisable. One major advantage Corian can offer over other surfaces is the seamless and joint less effect Which is manipulated to please the eye. Recent modern designers choose this specific material for this reasons alone over any other material.